Chances are, if you know anything about Italian food, you’ve heard of saltimbocca alla romana, veal scallops sautéed in butter with prosciutto and sage, then simmered in white wine. It’s a simple dish, full of robust flavor like much Roman cookery. But not as many people know its southern cousin, saltimbocca alla sorrentina. 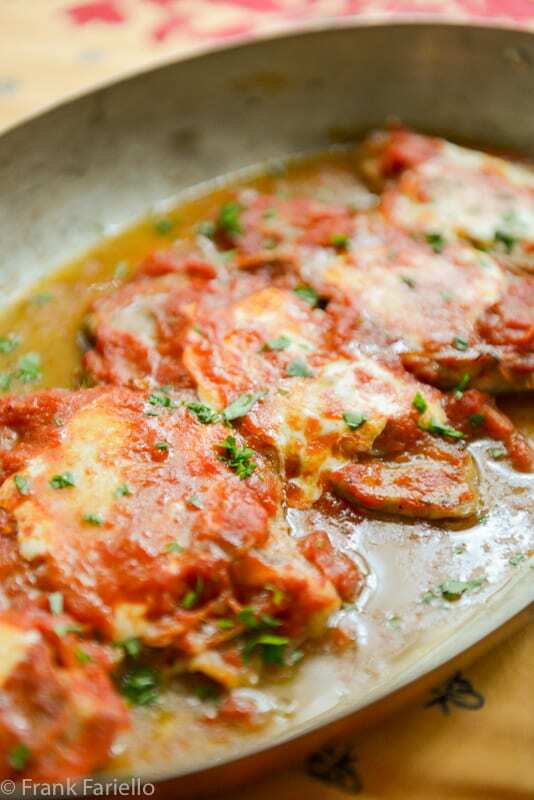 Like its Roman counterpart, the veal scallops are sautéed, but then, rather than simmering in white wine until done, they are quickly gratinéed in a hot oven with a tomato sauce and mozzarella topping, just like gnocchi alla sorrentina. It’s a quick and easy dish to make, as tasty in its own rather more delicate way as the Roman version. And you can easily make saltimbocca alla sorrentina ahead of time, giving it a quick final turn in the oven whenever you’re ready to serve. Put the canned tomatoes, passed through a food mill, along with fresh parsley, salt and pepper, and a drizzle of olive oil, in a saucepan and let simmer for 10 minutes or so, until reduced but not too thick. Trim off any fat or gristle from the veal scallops. Pat them dry, then lightly pound them with a meat pounder or the back of a skillet to flatten them out a little. Season them generously on both sides with salt and pepper. Season the scallops on both sides with salt and pepper, then lightly dust them with flour. Then, over a lively flame, brown them lightly on both sides in a combination of butter and olive oil, working in batches if need be. As they brown, remove the scallops to a baking dish large enough to hold them all in one layer, which you will have greased with a bit of olive oil. Degrease the skillet with a good splash of white wine, and nap the veal scallops with the juices. Lay a slice of prosciutto over each veal scallop, trimmed if need be to roughly fit the size of the scallop. Over the prosciutto lay a slice or two of the mozzarella. Then nap each scallop lightly with a spoonful or two of the tomato sauce. Drizzle a bit more white wine along the sides into the baking dish. The drizzle some olive oil over the scallops. Bake the scallops in a very hot (260C/500F) oven for 5 minutes or so, just until the wine is bubbling and the cheese has completely melted. Serve your saltimbocca alla sorrentina hot from the baking dish, sprinkled if you like with a bit of fresh parsley for color. The initial searing of the scallops should be very quick, as should the gratinée in the oven at the end, to avoid overcooking. Another point to bear in mind: You should not lay on the tomato sauce too thick, as it would overwhelm the delicate flavor of the veal. If you wind up with some extra tomato sauce, use it for pasta or other purposes. Otherwise, this is a very straight-forward, forgiving dish. Veal is an expensive meat, and not always easy to find these days. Some aspects of veal production have made it a controversial meat for many. If you don’t have access to veal or if you have ethical objections to consuming veal, or you just don’t want to spend the money, you can substitute slices of pork loin or turkey breast with quite acceptable results. Pork or turkey may be better choices, anyway, at least here in the US. In Italy, males calves are slaughtered for veal while they are still suckling. Their meat is cream-colored, velvety and delicately flavored. In the US, by contrast, the calves are nearly mature. They are often already feeding on a grass or grain diet. This results in a less tender, darker, ‘beefier’ tasting meat, which would more properly called vitellone in Italian. I’m not sure it is worth the premium price at which it’s sold. I understand that milk-fed veal is produced in the US, but I haven’t found it and I’m sure it must cost a King’s ransom. And while pork and turkey are common substitutes for veal in Italy, Americans would probably more like favor opting for chicken breast. The breast should be cut into half lengthwise and pounded flat. It’s also a OK choice in its own right, if rather less veal-like. Chicken breast tends to be bland, so be generous with the seasonings. And be especially careful with cooking times, as chicken breast dries out very quickly. Recipes also vary slightly in the flavorings. In some, dried oregano seasons the tomato sauce rather than fresh parsley or basil, in others salami stands in for prosciutto. In some dishes, a dusting of Parmesan cheese goes on top of the tomato sauce before baking. And you can grease the baking dish with butter instead of oil. A family favorite, so much so that at a recent graduation dinner for our daughter we selected it for one of the entree courses. I was just as the store this week, looking for veal, and I couldn’t find any!?!? (Is the kind of thing an old person says? Am I now so old that I remember when people ate veal?) Anyway, thanks for the suggestion of pork loin and turkey breast. Not chicken? Jeff, you and I are in the same boat! I can’t tell you the number of times I’ve looked for what I thought was a commonplace ingredient in a store and couldn’t find it. Times change… not always for the better. Now that really is the kind of thing an old person says! My husband would certainly enjoy this southern version as saltimbocca is a favorite of his. Well, do let us know his reaction if you decide to make it for him. I need to make these! They make my mouth water. I haven’t made them in ages and your photos always look amazing! Feel just the same way, David! Thanks, David. You know me, I’m all about the simple things. I have to see if I can find veal here in Santa Cruz. Both of your recipes look great. Thanks, Gerlinde! Hope you can find some good veal around there. If not, of course, there’s always pork or turkey. Work pretty well, too. I love veal, but as you stated, due to the lack of ethical standards here, I won’t buy or eat veal in the US. I’ve never made this, but both versions are fabulous! Need to add these to my ever-growing list! Thanks, Frank! And thanks for your comment, Christina! Do hope you try it some time. What a neat dish! And this variation of a classic is new to me. I can sometimes get good veal, but it’s hard these days. So for a long time I’ve used turkey or chicken (turkey is far superior, IMO). But for the last couple of years I’ve mainly used pork — it’s very flavorful and easy to work with. Anyway, wonderful dish — thanks. Thanks for your comment, John! Totally agree that pork and turkey are better choices than chicken. If it’s at all possible I would use fresh tomatoes for this. You don’t need high cost ‘heritage’ or imported ones just ripe vine-ripened. Cut an equivalent weight of fresh tomatoes into quarters, microwave on full for 5 minutes then put through the food mill coarse disk. Almost always a better flavour.